EXTRA 10% OFF everything in our Great Spring Giveaway! Like Yankee Candle? Click here to view the entire range. Bring some warming beauty to your home with this fragrant candle in a glass jar from Yankee Candle. 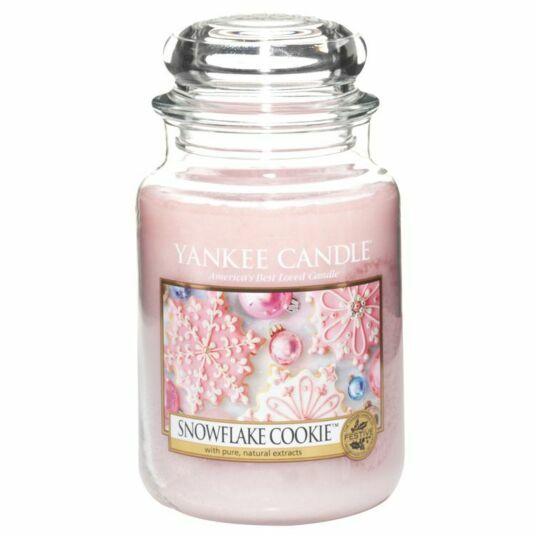 This wonderful scent will fill your home with the aroma of warm buttery cookies lusciously iced with sugary pink icing. Its delicious fragrant nature is certain to put you in the mood for cooking and celebrating Christmas traditions! This large classic jar candle has a burn time between 110-150 hours and reflects a warm, relaxed sense of style that’s always at home, be it in the bedroom, the bathroom, the living room, or anywhere else you see fit. A fabulous gift for a friend or a treat for yourself. Many Personalised gifts are excluded from our Free UK Delivery offer or any limited time offers as they are packaged and dispatched from a separate location. Personalised items may take longer than our standard delivery times, and Premium or Courier delivery may not be available. This information will be clearly indicated on the affected items. If you would like to return an unwanted or damaged item back to us please inform our customer service team at customerservice@campusgifts.com or 01494 790424 within 14 days of receiving the goods. If the product has been damaged or received incorrectly, contact our Customer Service team for a prepaid returns label. If however you have decided to return an item as it is unwanted please send this back to us at your expense, keeping a proof of postage. Yankee Candle is the largest and most reputed candle maker in the world. They have been making premium candles for over 40 years and are renowned throughout the globe for their huge range of scents and different styles of candle. It was Christmas, 1969, and a seventeen year old Mike Kittredge couldn't afford to buy his mother a present. Instead, he melted some crayons to make her a candle. A neighbour saw the candle and convinced Mike to sell it to her, and with that money he bought enough wax to make two more candles. One went to his mother, and the other was sold elsewhere. This was the birth of Yankee Candle. Their headquarters remain in their birthplace: Massachusetts, USA, and they have over 500 company-owned retail stores throughout the United States alone. With over 150 fragrances of candle, the best of which can be found online here, they are truly passionate about what they do. There's a reason Yankee have become so successful throughout the world, and it's a simple one: their passion for the highest quality of fragrance. Yankee's craftsmanship is passed down through their generations of chandlers (candle makers) as part of their heritage, who continue to create the highest quality product, as well as rigorously test and review any fragrance that passes their noses. Yankee Candle also has a long-standing commitment to sustainability, promoting socially responsible practises to ensure that their candles can continue to be enjoyed for generations to come. Whether packs of tea lights, car fragrances or elegant tumbler candles in glass jars, there is a style, and a fragrance for everyone. Yankee continue to release more products and more fragrances, meaning they are always at the forefront of what they do. So why not become a part of the phenomenon and let a little more light into your world!